PLEASE TAKE A LOOK AT THE GENERATOR SIZING GUIDE. GUARDIAN’s Ultra Source® portable generators are the most powerful portable generators on the market and offer the best value in the business. 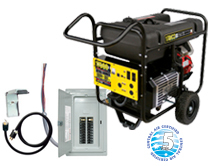 They supplement our complete line of residential and commercial automatic standby generators and are ideal for power on the job site or as an emergency source of electricity at home or in commercial applications such as gas stations. Our 15,000-watt and 17,500-watt models feature our own OHVI® 992cc industrial grade engine. This powerhouse is renowned for its reliability, long life, impressive power and smooth, quiet operation. Paired with our indoor rated manual transfer switch, the new 17,500-watt unit makes it easy to use a portable generator during an outage. With up to 16 pre-wired circuits, all that’s required is to start the generator and plug it in. By flipping a switch, the utility is locked out and the load is transferred to the generator.